This is a news story that predates my time here at Pocket Gamer, but after two years the Smart Boy will finally start shipping later this month. First announced in 2015, and then followed up in 2016, the Smart Boy is a handheld device which gives your Android phones a little bit of a retro boost. 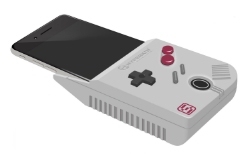 Essentially turning your phone into a Game Boy, the device features an eight-way D-pad, two action buttons, a start/select button, and a battery that can be charged through the phone (a little like a Gear VR). According to its website, the Smart Boy will be compatible with Game Boy and Game Boy Color cartridges. One of these bad boys’ll set you back £59.99/$ 59.99, so take a look on funstock Retro or on Hyperkin’s official site if it sounds like something you’d be into.